Manage All Your Schedules and Your Operatives With Our Mobile App and System Planner. With Eworks Manager, scheduling jobs couldn’t be any easier! With our scheduling App, all your mobile users will be able to manage their assigned jobs and either accept or decline! 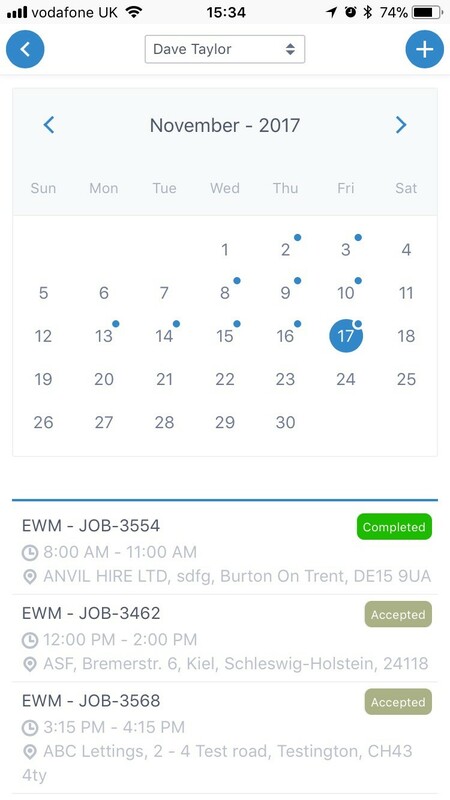 Your mobile users can now even create and schedule jobs in themselves via the Mobile App! With the Mobile App, your mobile users can even join other jobs that your other operatives are working on to make jobs quicker, making the customer happy with the service provided. Your mobile users can even check other user’s diaries by clicking onto the calendar feature, to see what other people are working on, but don’t worry, your users can only do this if they have been given permission to, so you are in control of what information can be shared with one another! Eworks Manager is the perfect sales CRM Software as you can easily plan, keep track of and manage all jobs within the Mobile App. You can also manage your sales team for appointments or your workforce for installations via the Mobile App! Unlike most Job Management Software out there, we provide constant support to all our customers, whether you have a quick question, require some more training on the admin system or the app or require a bespoke to change, we are always here to help with our super friendly customer service team and 24/7 support email. Eworks Manager offers many company benefits and above is just one feature so if you’re ready to ditch the paperwork and start your Eworks journey, sign up for your 14-day FREE trial and try it out for yourself! If you would like to hear more about our mobile scheduling software, please feel free to call our office directly or pop us over an email, we would love to chat and book in a free online demonstration of the software!